HAWAII: A magnitude 6.9 earthquake shook Hawaii’s Big Island today (May 5), prompting fresh eruptions of a volcano that has been spewing lava near residential areas, forcing hundreds of people to flee. The US Geological Survey said the quake struck at 12:32 pm (5:32am Thai time) and was centred on the south flank of the Kilauea volcano, which first erupted on Thursday (May 3) after a series of tremors on the island. “This is in almost exactly the same location as the deadly 1975 M 7.1 quake,” USGC said in a tweet. That quake killed two people and injured 28. Another 5.7-magnitude tremor hit the island yesterday (May 4) and authorities said they expect more seismic activity. The quakes have prompted the Kilauea volcano, one of five active on the island, to erupt. Drone and video footage showed orange magma gushing up from cracks in the ground and snaking through a wooded area. Molten lava could also be seen bubbling up through cracks on streets in the Leilani Estates and Lanipuna Gardens neighbourhood where residents were ordered to evacuate on Thursday. The area is home to about 1,700 people and 770 structures. The broader district potentially impacted by the threat is home to some 10,000 people. No injuries have been reported but several homes were said to have been destroyed or badly damaged, authorities said. Officials urged any remaining residents to evacuate and warned of extremely high levels of toxic fumes. “Elderly, young and people with respiratory issues need to comply with the mandatory evacuation order and leave the area,” a statement from the mayor’s office said. Governor David Ige said residents were being housed in community centres until the danger from Kilauea, one of the world’s most active volcanoes, has passed. Ige signed an emergency proclamation releasing disaster funds to the Big Island. A 5.0-magnitude earthquake early Thursday south of the cone triggered rockfalls and potential additional collapse of the crater, USGS said. It sent a short-lived but massive pink plume of ash wafting into the air. Big Island resident Janice Wei, who moved to Hawaii from California – known for its own high earthquake risk – said the eruption was almost a “relief”. “We’ve been waiting for big movement from the crater, after so many small earthquakes,” she told said. “Hawaiians and local people have lived here forever,” she said. “You know what’s going on; we have warning systems. Using his drone, area resident Jeremiah Osuna captured video footage of the lava flow, which he described as a “fire curtain” that left him feeling “shock and awe”. “It was like if you put a bunch of rocks into a dryer and turned it on – a lot of earth and pressure and fire just moving around,” Osuna said. Governor Ige activated the state’s National Guard troops, and told residents to pay heed to official warnings. In his emergency declaration, the governor noted the current flow was similar to a 1960 eruption in the Kapoho area that “caused significant damage”. 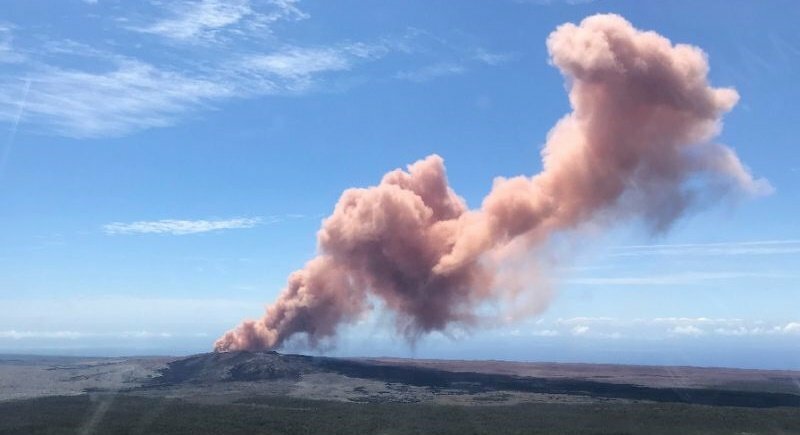 Geologist Janet Babb of the Hawaiian Volcano Observatory said that scientists had been following an “intrusion of magma” down the rift zone since Monday afternoon (Apr 30) in anticipation of a possible eruption. Though the cracks from which lava was emitting had gone dormant, she emphasised that “the overall concern and the overall event has not ended”. US Senator Brian Schatz of Hawaii said the Federal Emergency Management Agency was mobilising resources, as well as monitoring for forest fires, power outages and water supply issues.